Mountain Biking in Nepal allow you to explore diverse terrain of remote area where other means of transport unable to rich. Mountain biking offers an environmentally sound way of exploring this magnificent country and its landscape and living heritage. There are virtually millions of tracks out there so some people are even started calling Nepal a “Mecca for Mountain Biking”. We bring you information about Mountain Biking in Nepal, mystical place with 10 of the 14 tallest mountains in the world. There are plenty of dirt roads and trails in Nepal to meet every mountain biker’s wildest fantasy. Mountain biking is also recommended if you wish to explore the urban parts of Nepal. What you can or cannot do on mountain bike is limited only by your imagination. It was in the mid 1980s that biking activity really took off in Kathmandu. Enthusiasts flew with their bikes from East Asia to Tibet to do a 2-weeks journey from there over the passes (17,000 ft.) to Nepal. In Nepal you will ride through lush green rice fields, through hamlets, up and down the hillside, along the riverbank, around temples, past the street-roaming cattle, along the suspension bridge, along the highway, you name it. Through snow, monsoon downpour, wonderful light effect, or fierce head winds, depending on place and season. The adventurous souls may plan extended trips. You could even do the entire length of Nepal across the plains. 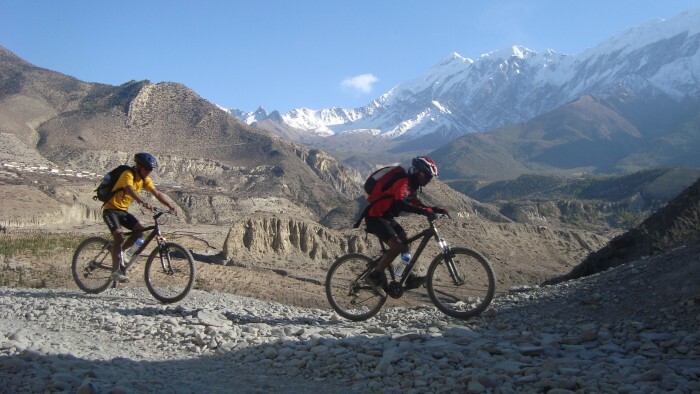 The Best Selected Mountain Biking Tour Destination in Nepal. Start from the nerve center of old Kathmandu, the Durbar Square, and wind your way up to holy Swayambhu, also known as the money temple. Then ride up and over ring road, to way, Kakani, and re-enter Kathmandu from the northwest corner through terraced farmland and hamlets abandoned by time. By evening end the biking trip and back to hotel for rest. Early morning frab the bike and start the riding begin at Thimi, the restored capital of Bhaktapur, and head up the tortuous road to Changu Narayan Temple and return via farming villages. Then head down to Pashupati along the bank of the Bagmati River, and finish up at a Buddhist shrine, the Bouddhanath Stupa. By evening end the biking trip and back to hotel for rest. Start in Patan, winding your way though the maze of alleys with ornately carved windows, taking in historical sites such as the Golden temple, Krishan temple, and Patan Durbar Square. Then head southeast past Ring Road to Panauti along a difficult off-road trail. Then return to Kathmandu via a paved road or the same trail. Alternatively, you could head off to Dakshin Kali or Godavari. Other outlying places popular with the enthusiasts are Nagarjuna, Nage Gompa, Tokha, Ichangu Narayan, Gomcha, Bungamati, Kakani, Dhulikhel and Nagarkot.